If only all blind dates could go so smoothly. Oh to be Jean-Michel Jarre or Richie Hawtin for a day. After all, what could be better than a pleasant conversation about the architecture of sound and Japanese aesthetics, washed down with some of the world’s finest sake while master chef The Duc Ngo attends to your culinary predilections? Yes, that’s right. 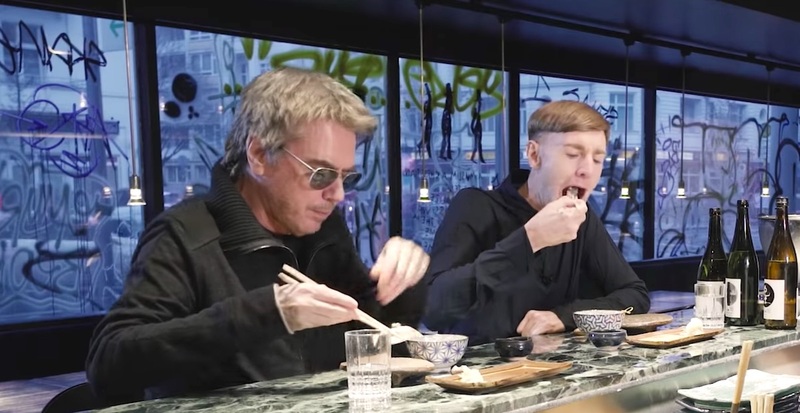 The seminal French new age synth guru and the techno don recently enjoyed a blind date together as part of the newest episode of German public television show Bongo Boulevard. There was no shortage of things for the duo to discuss. Whether exploring the influence of art on Jarre’s music or nerding out about the intricacies of synth design, both musicians offer up fascinating insights into their practices. In fact, their chemistry was so good that Bongo Boulevard have made the whole 70-minute date available to watch. Check it out in full above. For food lovers, this comes with a serious NSFW warning.